Lewis Hamilton stormed to a floodlit victory in the Singapore Grand Prix on Sunday while Jenson Button fought through the field to extend his championship lead to 15 points with three races left. 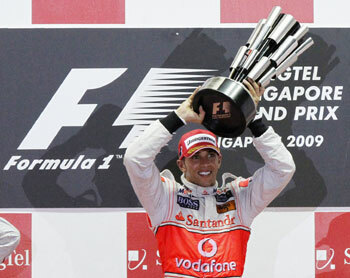 McLaren's world champion drove brilliantly around the 5.067km Marina Bay street circuit to lead from start to finish in the gruelling 61-lap race, finishing 9.6 seconds ahead of Toyota's Timo Glock. 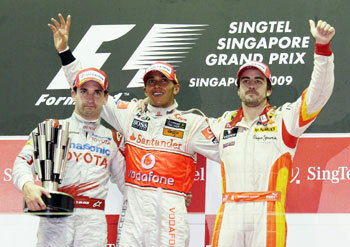 Last year's winner Fernando Alonso was third for the embattled Renault team, reeling under a suspended permanent ban imposed for fixing the inaugural night race in 2008. While Hamilton emerged from the cockpit to kiss pop singer girlfriend Nicole Scherzinger and embrace his mechanics, fellow-Briton Button had as much to celebrate after climbing from 11th on the grid to fifth at the finish. Closest rival and Brawn team mate Rubens Barrichello was sixth after starting ahead of him in ninth place. Brawn edged closer to claiming the constructors' title in their debut season as rivals Red Bull let slip a great opportunity to narrow the gap between the teams. Red Bull's Sebastian Vettel had started alongside Hamilton on the front row but a drive-through penalty for speeding through the pitlane on his second stop ended any hope the German had of winning the race. He had to settle for fourth place. 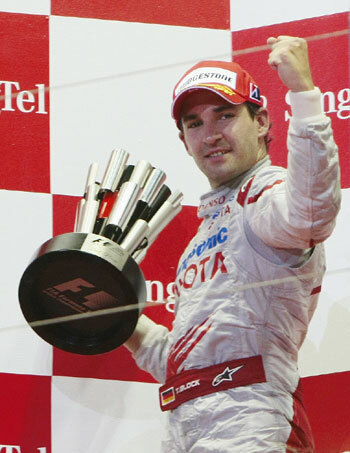 Glock, whose Toyota started sixth in the grid, ensured the Japanese side its first podium in a yer. The German finished 9.6 seconds behind the eventual winner. 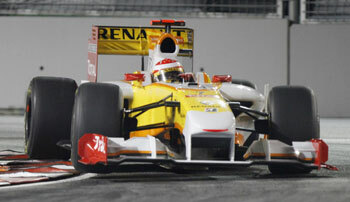 Glock had finished second behind Finn Heiki Kovalainen at the Hungarian Grand Prix last year. Renault Formula One managing director Jean-Francois Caubet strongly suggested on Sunday that double world champion Fernando Alonso would leave the team at the end of the season. "Renault will remain his family," Caubet told French television channel TF1 when asked whether Alonso might leave. "We will miss him but he will miss us." The Spaniard, who finished third in Sunday's Singapore Grand Prix, has been linked to reigning champions Ferrari for months with his move considered an open secret in the Formula One paddock. Alonso won world titles with Renault in 2005 and 2006 and rejoined the team in 2008 after a one-year spell at McLaren.